Production has halted on the sixth season of hit drama House Of Cards, following a historical harassment allegation made against lead star Kevin Spacey. Online streaming service Netflix and show producers Media Rights Capital (MRC) said in a statement that the suspension would continue until "further notice". 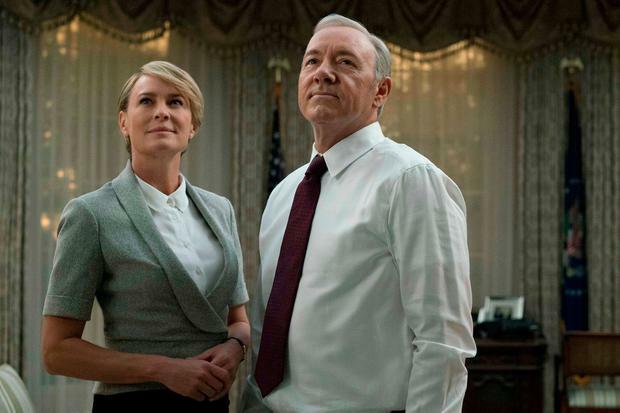 The statement, issued on Tuesday, read: "MRC and Netflix have decided to suspend production on House Of Cards season six, until further notice, to give us time to review the current situation and to address any concerns of our cast and crew." The decision follows a claim by actor Anthony Rapp, who recently told online publication BuzzFeed that Spacey had placed him on a bed and climbed on top of him following a party at his apartment. Spacey would have been 26 at the time of the alleged 1986 incident, while Rapp would have been 14. Spacey, who plays Francis Underwood in the political thriller, responded with a statement posted on Twitter on Monday, where he said he was "beyond horrified" by the claims. He added that the story had made him "address" other personal matters and that he chooses "now to live as a gay man". The two-time Oscar winner, 58, has also faced a backlash from London theatre The Old Vic, where he was formerly artistic director. Barely two years after Spacey finished a 12-year stint at the helm of the company, a spokeswoman said in a statement: "The Old Vic would like to respond to recent media reports by making it clear that we are deeply dismayed to hear the allegations levied against former artistic director Kevin Spacey." The statement added: "Inappropriate behaviour by anyone working at The Old Vic is completely unacceptable. Earlier in the day, another statement from the organisation confirmed: "During Kevin Spacey's tenure as artistic director no complaints were made against him," adding that "no complaints have been made since he left". The International Academy of Television Arts and Sciences has also revoked an award it had planned to present to the actor in November, announcing in a tweet: "The International Academy has announced that in light of recent events it will not honor Kevin Spacey with the 2017 Intl Emmy Founders Award." Netflix and MRC said in a previous statement that they were "deeply troubled by the allegations" against Spacey and that company executives were meeting with cast and crew "to ensure that they continue to feel safe and supported".